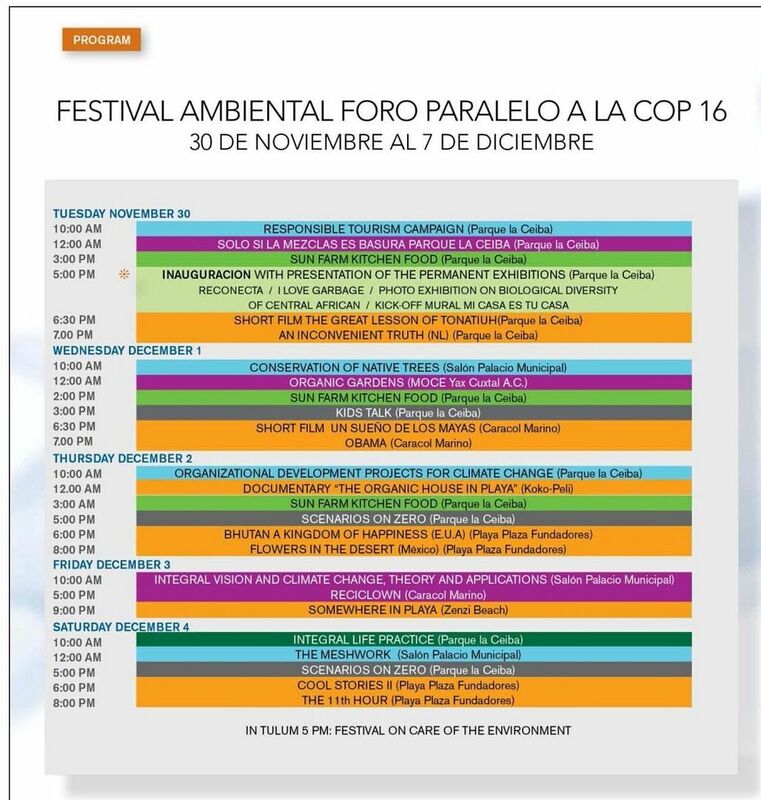 Life's a Beach | Expat Life in Playa del Carmen : The Riviera Maya Welcomes COP16 with a Series of Eco-Events! 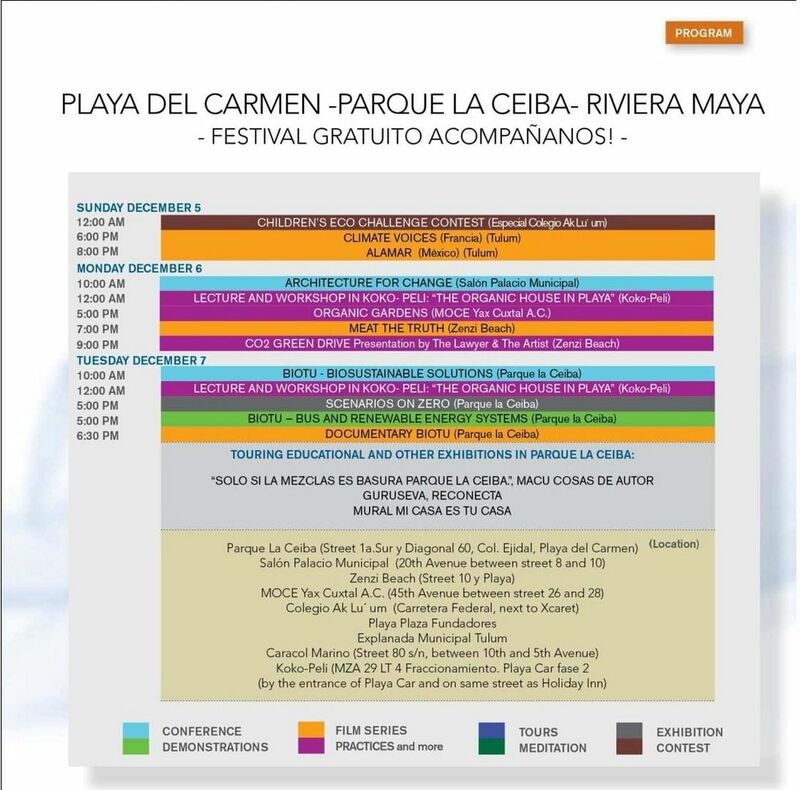 The Riviera Maya is abuzz with activity and excitement this week as Cancun welcomes the delegates of Parties to the United Nations Framework Convention on Climate Change and the Kyoto Protocol. As the host country, Mexico is conduction an inclusive conference with the aim of building understanding among the Parties to ensure that COP16/CMP6 deliver concrete and effective results to tackle the global challenge of climate change. Mexico has encouraged broad participation in the conference as well as extensive dialogue in the collective search for common solutions. Running concurrent with this important summit are dozens of festivals and events organized to compliment the theme of the conference in Cancun. Many of these activities are family oriented and all help to promote a way of life that is healthier for us and for the planet we all share. 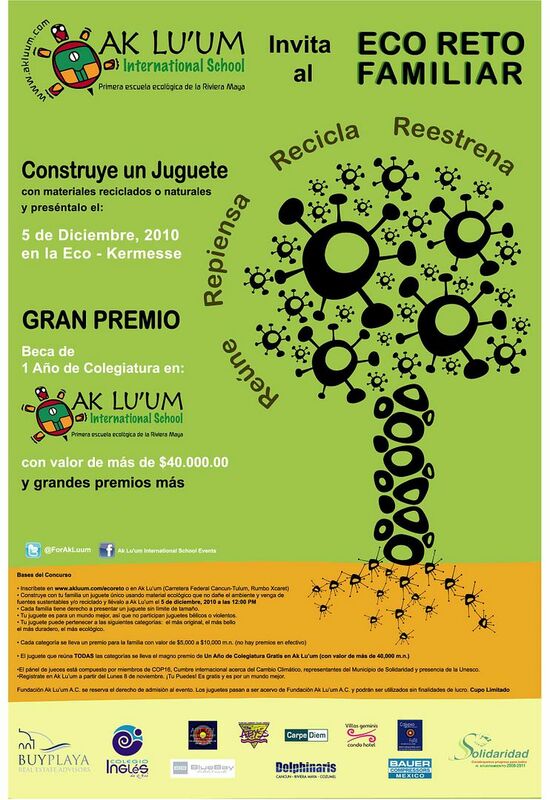 One of these events is the first of its kind Eco-Challenge 2010 hosted by Ak Lu'um, Mexico's first ecological school. The contest, which is free of charge, invites local families to design and build a unique toy or game that encourages play without doing harm to the environment. Each submission must be constructed using organic materials, materials that come from sustainable sources and/or recycled objects and will be judged in several categories: most original, most ecological, most durable and most beautiful. Confirmed on the panel of judges are delegates from the COP16 Climate Change Summit taking place now in Cancun, environmental leaders from the Municipality of Solidaridad and representatives from Flora, Fauna y Cultura. Local businesses have generously supported this exciting event with donations of prizes for the winners in each of the four criteria. Among the prizes are family passes for Xcaret, a family snorkel excursion with Abyss Dive Center, a boat trip for up to five people donated by Bauer Compressors, a swim with dolphins experience at Dolphinaris, a weekend stay in Tulum at Villas Geminis and an electric scooter donated by Carpe Diem Communications. The grand prize, awarded to the family whose toy best meets all four criteria, will be a year of free tuition at Ak Lu’um International School. This scholarship is valued at over $43,000 mn and is transferable. The contest and eco-fair will take place on December 5, 2010 from noon until 2:30 pm on the school grounds in Playa del Carmen. Event organizers have invited local organizations and businesses to participate in this one of a kind event. There will be a marketplace pavilion where local retailers will offer eco, natural or organic products and/or food services. Registration is still open for both the contest and the marketplace although the space is limited. For more information including directions to the school campus contact akluum@gmail.com. Take a look at the complete list of events scheduled from now until January 7th and see if there might be something that would be fun and informative for you and your family!